the home of book reviews on the web! 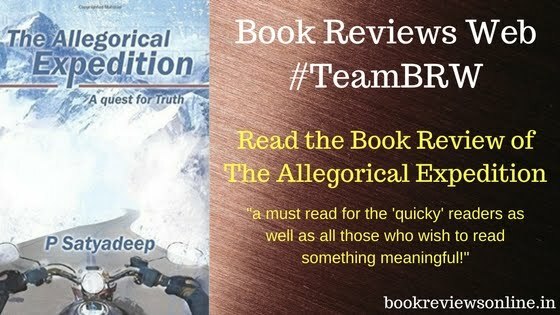 So, The Allegorical Expedition, which is subtitled 'a quest for truth', has very few characters which might be taken as those centric ones around whom the novel revolves and the plot moves. There is a Satyajit, who is the protagonist of the novel; there is a Maaya; there is a Pandit ji, and a few other characters. Satyajit, better known as SJ further in the novel, is a successful person in the field of cinema. However, his craving and perhaps the two questions once asked by his father to him, lead him to inquire further and further and do something 'extraordinary'. Riding his whim, he sets out for an expedition and this very expedition becomes the source on which the novel's plot feeds. As beautifully brought out by our senior Alok Mishra in his review of The Allegorical Expedition, the most striking factor of this book and the author is their revisiting the historical and mythological annals. If you give a least to the religious and mythological texts, believe it, you are gonna love this book! Meanwhile, the novel concludes with SJ finding a perfect script for his next movie which goes on to become a blockbuster. He finds a scanty piece of peace and solace but only to be disrupted, because, the revelation of truth, dear friends, is not so calm! The author P Satyadeep has concluded the novel as of beginning the another part which he has hinted out in an interview. Can Goodreads reviews get you free books? An extension to Book Reviews Online Project by Ashvamegh. Ethereal theme. Powered by Blogger.